This morning I woke up earlier than the Hubby and knew I wanted to make something for breakfast. Once the coffee had time to kick in, I decided on clafouti. I’ve made savoury clafoutis before, which in essence is a glorified frittata, which truth be told I’m not a fan of. But I had it in my mind that a sweet clafoutis would be more like a biscuit than an omelet. 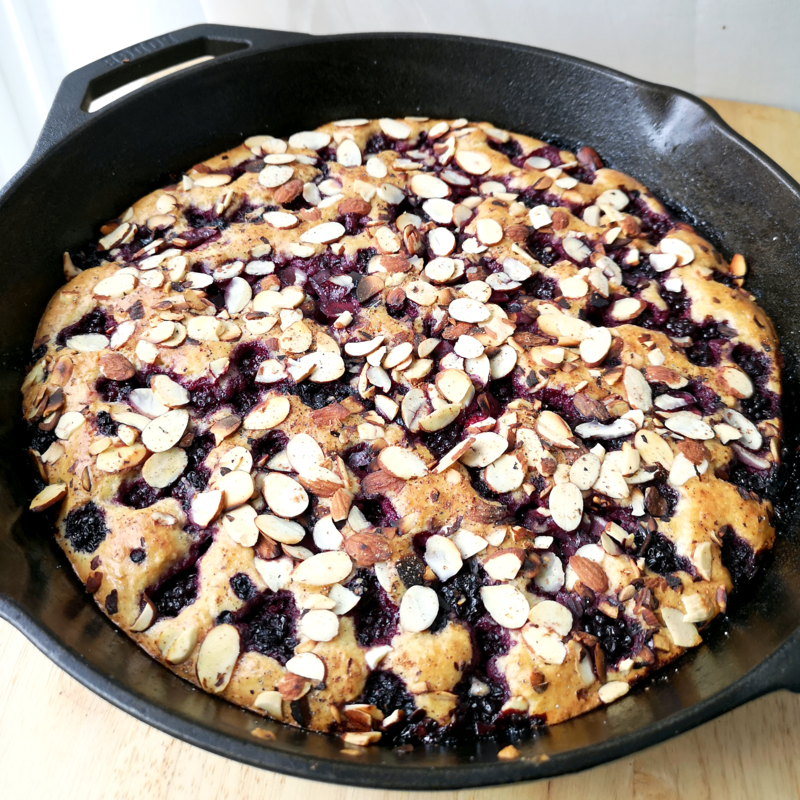 So used up the last of the summer blackberries I had in the freezer and threw together some blackberry clafoutis with toasted almonds. I think I’ll stick with the sweet version of clafoutis from now on. It tastes a bit like waffles or even somewhat tart-like. I’m thinking some little dollops of creamcheese next time would kick it up a notch! Preheat the oven to 400°F and either butter a pie plate or well oil a cast iron pan. In a medium bowl, combine the eggs, vanilla, whipping cream, and pinch of salt. Whisking until frothy and light. Add the Splenda, flour, and spices and whisk until well blended. Pour into the pan and sprinkle with the blackberries. Use a spatula to gently tap them into the batter. Sprinkle with the almonds, again using a spatula to press lightly into the batter. Give a light dusting with fresh ground nutmeg and ground cardamom.